Whether you’re organising your Christmas Conference, your office Christmas party, a festive night out with friends, or getting the whole family together; there is something for everyone at Crowne Plaza Marlow: Festive Lunches, Christmas Conferences, Festive Family Events with children’s discos, Christmas and Boxing Day lunch, our ever-popular ‘Join a Party’ Nights, and New Year's Eve celebrations. Escape from the hustle and bustle in our award-winning AA Rosette Glaze Restaurant or stunning Conservatory with views overlooking the lake. Get together with friends, family or colleagues at Christmas time and enjoy a delicious Festive Lunch at this gorgeous lakeside venue! 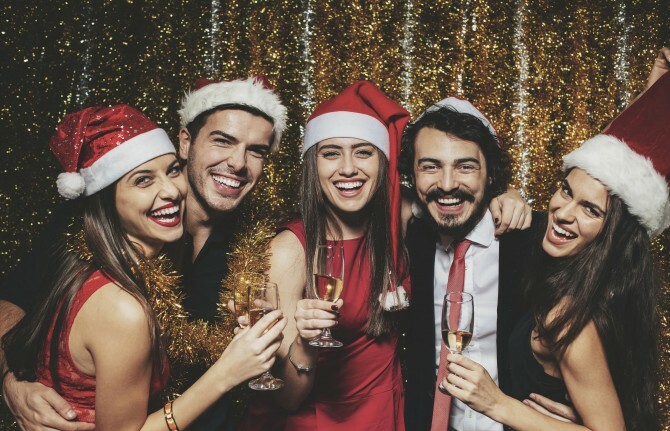 The perfect solution for groups of friends, colleagues or clients, our ‘Join A Party’ Nights are a great option for smaller parties looking for a big party atmosphere, great for celebrating with your friends, family or work colleagues at Christmas. Our ready-made Christmas party nights include a delicious three-course dinner in the stylish surroundings of the AA Rosette Awarded Glaze Restaurant or Conservatory followed by a disco until 2am. The stunning setting of our Winterlake Suite offers the perfect backdrop for larger corporate or private Christmas parties. The Suite seats up to 300 guests, with a dance floor, impressive lighting and dedicated terrace bar — perfect for drinks on arrival. Our Christmas Party Event Co-ordinators are on hand to tailor your event and arrange bespoke elements for your party such as themes, entertainment and décor. Join us for our Festive Family Lunch this Christmas for a festive celebration the whole family can enjoy. A sumptuous Festive Carvery Buffet will be served up with a separate Kids' Buffet. Following the Christmas carvery, the children will be thoroughly entertained with our Kids' Christmas Party, disco and entertainment. A special visit from Father Christmas will be the perfect start to your festive season. Let our Executive Chef tempt you with a traditional three-course Christmas day lunch in our vibrant AA Rosette Glaze Restaurant whilst you celebrate your Christmas in style with your family and friends. Enjoy a glass of Bucks Fizz on arrival and unlimited Prosecco (served between 12pm and 4pm) throughout your meal whilst you enjoy music from our talented resident pianist. There will even be a special visit from Father Christmas to ensure that all the children receive a little something extra this Christmas. After the hectic festive season, sit back, relax and enjoy a fabulous Boxing Day Lunch, hand prepared by our very talented brigade of international chefs with a glass of chilled Prosecco or Virgin Mary on arrival to kick off the celebrations. End the year with a bang! Celebrate New Year's Eve with family and friends at our wonderful New Year's Eve Dinner in our AA Rosette Awarded Glaze Restaurant & Conservatory with disco and a spectacular fireworks finale over the lake to welcome in 2020. See out the old and bring in the new at our New Year’s Eve Gala Ball in our stunning Winterlake Suite. Enjoy a chilled glass of bubbles and canapés on arrival, followed by a sumptuous four-course meal accompanied by a disco and a spectacular fireworks finale over the lake at midnight to welcome in 2020! Dress code is black tie. Over 21s only. Why not be slightly decadent and sample a taste of naughtiness this festive season? Enjoy a selection of Festive Finger Sandwiches, Homemade Cakes and Fresh Scones with Clotted Cream and Jam accompanied by a glass of chilled Prosecco. Come and join us for a delicious Christmas inspired afternoon tea! Detailed terms and conditions are available for your chosen event(s) once you add the tickets to your basket using the DigiTickets booking tool (links above). Please read terms and conditions carefully before agreeing to them and making your booking. Please call us on 01628 496 820 or email events1@cpmarlow.co.uk should you require any additional information.